The colt was a late foal in May of 2012, and was winless in two starts as a juvenile in 2014. He didn’t break his maiden until his fourth start the following season at Gulfstream. 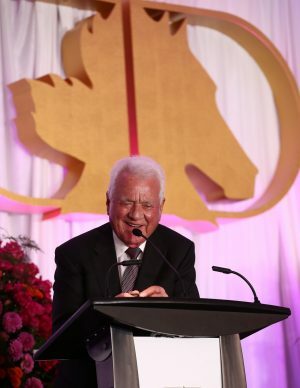 However, before the year was over he was a Sovereign Award winner as Canada’s champion three-year-old, winning the Marine Stakes and the Queen’s Plate and finishing second in the Prince of Wales. An ankle injury ended his season. 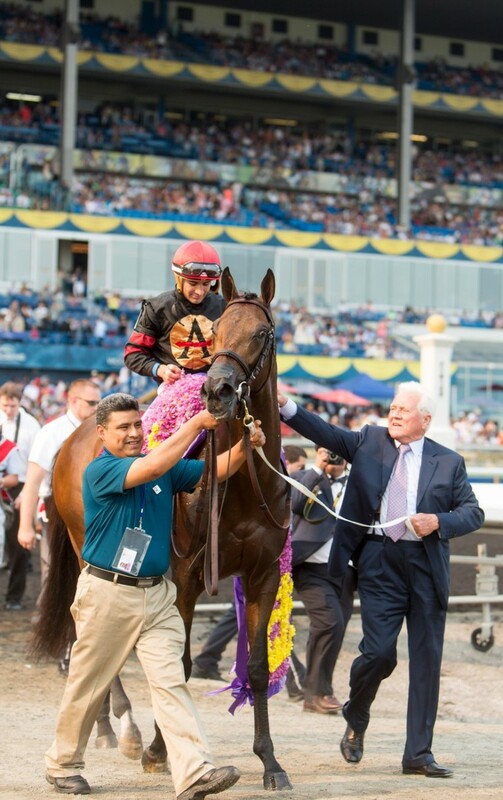 Switched to the stable of trainer Jimmy Jerkens, who gave the colt time to recover from the ankle surgery, the 2016 campaign would firmly establish Shaman Ghost as one of the best on the continent, winning the Woodward (GR1) at Saratoga, Brooklyn Invitational (GR2) at Belmont and finishing third in the Clark Handicap (GR1) at Churchill Downs. A fever forced Jerkens to scratch him out of the Breeders’ Cup Classic. 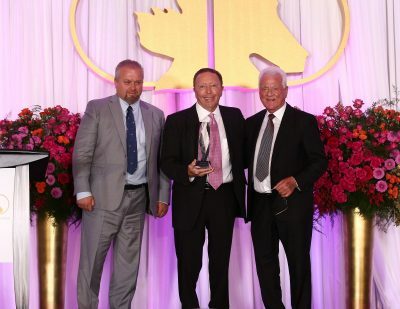 Race caller Dan Loiselle, presents Andy Stronach (left) and Frank Stronach with Shaman Ghost’s Hall of Fame trophy. By the time his 5-year-old season was over Shaman Ghost’s career earnings would soar to $3.8 million, a total only exceeded by his grandsire, Awesome Again. In 2017 he won the Santa Anita Handicap (GR1) and the Pimlico Special (GR3). He finished second to Arrogate in the world’s richest race, the $12 million Pegasus World Cup (GR1) at Gulfstream, earning $1.75 million while finishing ahead of California Chrome. His final race saw him finish second to Keen Ice in the Suburban Handicap (GR2) at Belmont. Shaman Ghost was retired for the 2018 breeding season and stood at Loveacres, California.